If you have any suggestions or bug reports feel free to post them! I just wanted to say, having had the same problem wit Nemu, that this is fantastic! Already it's great and your TODO list looks to make it even better. 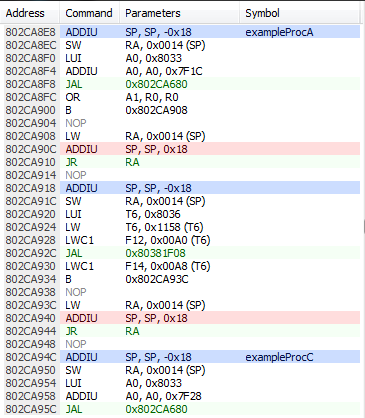 Once nice feature would be highlighting uses of the selected instructions registers, so for example, if the selected instruction is LW T9, 0x0000(A0) you can quickly scan up the list to see where A0 is set, and down the list to see where T9 is used. Will it be possible to keep track of the calling stack with this debugging tool? Other features like register usage highlighting, a stack frame viewer, and a symbols manager have also been started - these are far from finished though. Just been using the latest version, great stuff One minor niggle is that the font in the commands window isn't monospace, so if there are lots of As in a register, for example, the last value gets cut off. Individual scripts are now stored in "/Scripts"
Some additions in this snapshot are half-baked but I figured I'd put something up right now because it's been a while since the last update and having convenient memory breakpoints is important. 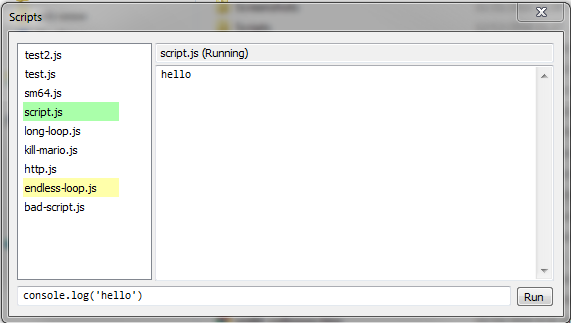 Double-clicking a script name in the list runs a script in its own thread. Yellow means initialising, and green means the event loop is running and events are waiting to fire. If the selected script is in its event loop state, the text input on the bottom can be used to evaluate code within its context (press Enter to run the code, up and down arrows to scroll through input history). 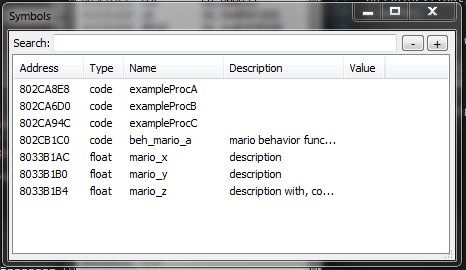 Opening the symbols window while a game is running creates a file in "/Save" named "[GAME NAME].sym". Clicking the "+" button adds a new symbol (it doesn't save to the file yet, but manually edited files do work). 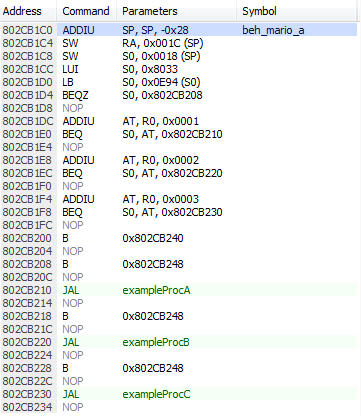 Double-clicking a symbol with the "code" type opens its address in the commands debugger, and doing the same for any other type opens the memory viewer. 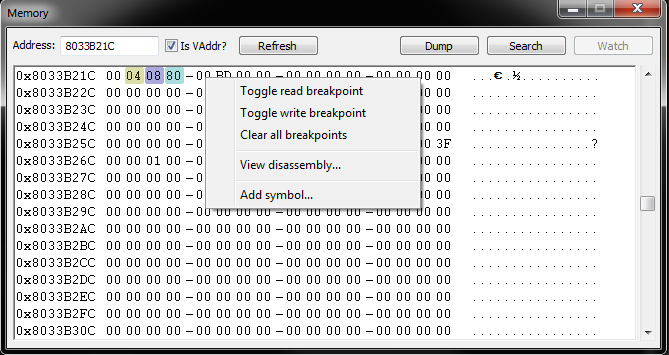 The format for the symbols (.sym) file is plaintext CSV where each line has a hexadecimal address, data type, name, and an optional description in that order. 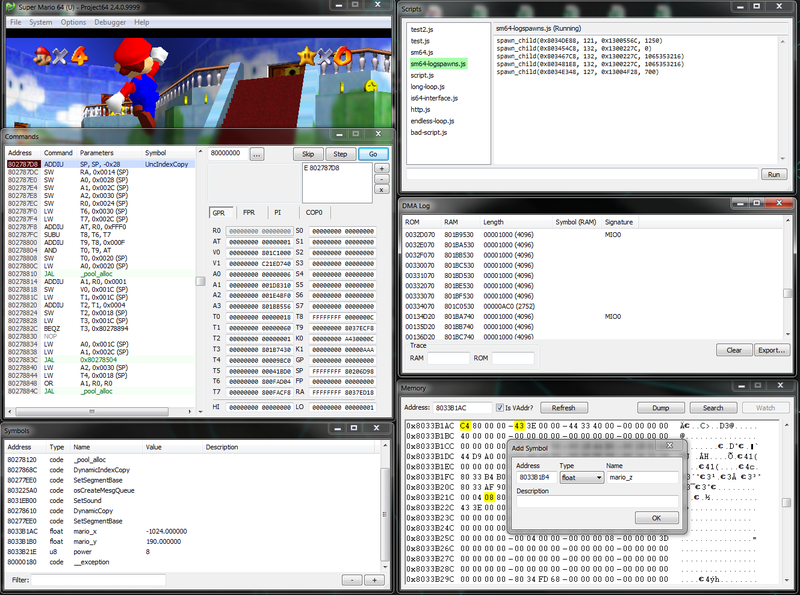 This might be tweaked later to be a superset of Nemu's COD file format for compatibility. Valid symbol types are: code, data, u8, u16, u32, s8, s16, s64, float, and double.